As much as people hate doing their laundry, if there is one thing everyone hates more is actually ironing their clothes. It is one of the most boring and annoying chores but it has to be done one way or another. A wrinkled shirt or pair of pants simply does not look good. Nobody cares if wrinkled clothes are worn around the house but going to the office or for dinner with a shirt that has not been ironed properly is just embarrassing. There is no escaping it but there are tricks to make it a bit easier and get excellent results with a minimal amount of effort. A simple way to get rid of wrinkles is to get a garment steamer. These amazing devices have been around for quite some time but they did not gain enough popularity amongst regular home users. Garment steamers have been used successfully for commercial use such as dry cleaners. For someone at home, a garment steamer can be a true alternative to a regular iron. What makes them work so well is actually the steam. It fills the fibers with a bit of water in the form of steam which softens it and allows for the wrinkles to disappear. Gravity and steam work together to make this everyday chore a whole lot easier. The only question that remains is what model to get? There are plenty of different garment steamers and some are quite large while others are quite portable. We decided to make a small list of garment steamers that perform well, do not cost a lot of money and will not break down after a few months of usage. 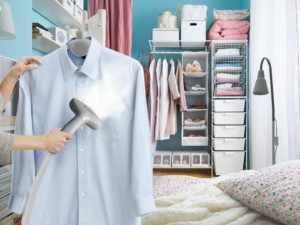 With these things said, here is our list of recommendations for the top 10 best garment steamers in 2019. 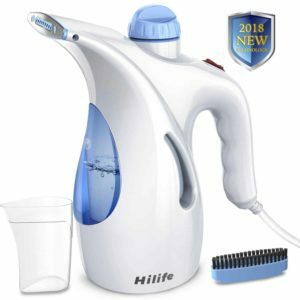 Hilife garment steamer is a great little appliance that will make it much easier to get rid of wrinkles on clothes. It is a portable steamer with a small water tank and just an adjustment dial that can be used to control the steam. For safety reasons, the steamer has an automatic shut-off in case it gets too hot. Because of its compact size, the steamer is travel-friendly and works with all types of fabrics. The water tank needs to be filled through a small hole right above the on and off button. Placement is not ideal and the hole itself is not very large. The small filling cup included makes things easier. Not using the cup might cause water to be spilled all over the steamer. Shark Press and Refresh garment steamer is a portable model that offers excellent results. 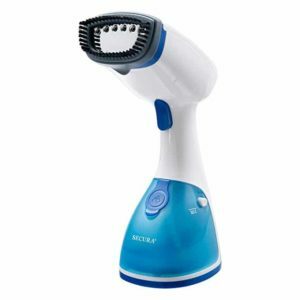 It spreads the steam over a larger surface and has a small brush that helps remove wrinkles. The steamers heat up quite fast and can be used on regular vertical ironing boards. The water tank of the device is large enough and using it is quite straightforward. To turn it on all it takes to push the trigger on the handle. Build quality is also quite decent and does not feel cheap at all. The steamer works very well as long as it is used over a flat vertical surface. It scores negative points because of its price tag. It is a bit on the expensive side and there are several models that are just as good but are less pricy. Pax Clothes Steamer is a good pick for the ones that are on a tight budget. This inexpensive model works with all types of fabrics and takes only 60 seconds to heat up. Because of its compact form factor, the steamer is travel-friendly. As for ease of use, it only has an on/off button and offers about 10 minutes of continuous usage on a full water tank. Filling the tank is quite straight forward and quite easy since it has a large opening that can be accessed by just twisting the top side of the steamer. The steamer works great as long as it is not tilted too much. It seems that the manufacturers did not design the tank to be sealed in some way. Just to be safe, it is better to test how much the steamer can be tilted before water starts coming out. 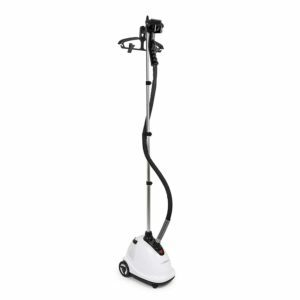 Secura Instant-Steam handheld garment and fabric steamer offers excellent value for the money. The steamer is quite inexpensive and offers enough power to get it hot and ready to go in under a minute. The water tank is reasonably large and offers about 15 minutes of continuous usage before needing to be refilled. As for construction, the steamer has a stainless steel faceplate as well as a detachable cleaning brush. The power cord is reasonably long but most importantly, it is tangle-free. One thing that will be easy to notice is the size of the steamer. It is quite large. In fact, it is larger than most other steamers on our list. This is because of the water tank as it has a larger capacity. Rowenta IS6300 Master Valet garment and fabric steamer is the kind of product that appeals to those that do not like compromises. It is a full-size steamer with roll-and-press vertical support. It has a built-in hanger with clips that makes it much easier to work with. The water tank offers about 1 hour of continuous usage. The pole of the steamer can have its height adjusted and the steamer head has a reasonably long hose. Finally, the steam diffuser is quite wide which helps get the job done faster. The handle and the hose of the steamers get quite warm. Due to how it was designed, there is no workaround for this issue. It is actually a common issue amongst steamers like this. Some get hotter than others. It is just something to keep in mind. 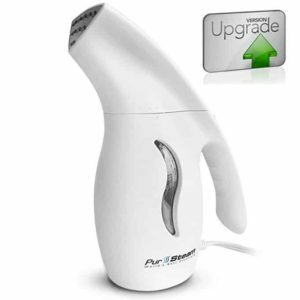 Pure Enrichment PureSteam XL is a rather attractive option mainly because it is a full-size regular steamer and comes with a modest price tag. It has a fast heat up time of just 45 seconds and a decently large water tank. A full tank will provide about 60 minutes of continuous usage. A useful feature is the fact that it has a hanger with clips. Filling the steamer is quite easy and straight and turning it on is a simple as pushing a button. The hanger pole is removable which makes it easier to store while the hose is reasonably long. A garment steamer is designed to remove wrinkles but not all of them are fast. The PureSteam XL works quite well but it takes time to remove wrinkles. It makes it easier but it also requires a bit of patience. 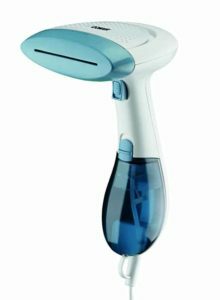 Conair ExtremeSteam Hand Held fabric steamer is an inexpensive model that works very well and is quite easy to use. The steamer was made to be compact and highly efficient. Using a dual heat system, the steamer heats up in about 75 seconds. A full tank of water will be enough for around 15 minutes of continuous usage. The retail package comes with a few extras such as a fabric brush, a soft cushion brush, creaser and a removable water reservoir. 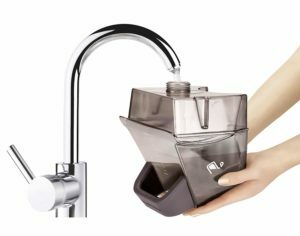 The small water tank only offers about 15 minutes of use before needing to refill it again. This is not a major issue but it is something worth noting. Since nobody uses a steamer for just 15 minutes, this means that it will need to be refilled several times. PurSteam Elite garment steamer is one of the best options is its range. The model is a full-size steamer with a large 61 fl. Oz. capacity and a tall pole with a hanger. Heating up takes about one minute and a full water tank will be enough for 60 minutes of continuous use. The steam reaches 248 degrees which will help relax fibers and remove wrinkles better than most other steamers. Finally, the pole and hanger can be removed, making the steamer much easier to store. While the steamer is easy to take apart, cleaning it is not that easy. There are a lot of parts that need to be removed and that can be both annoying and time-consuming. Compared to other steamers, this one is probably the most difficult to clean. 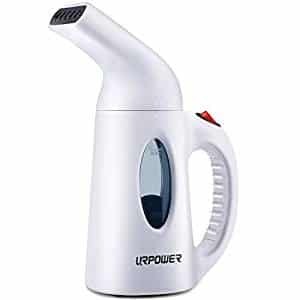 URPOWER garment steamer is not only affordable but extremely convenient. Designed as a portable steamer, the model is quite small and lightweight. Filling the tank is extremely easy as all it takes it to remove the top part. The nozzle design helps with a wide and even steam distribution while the tank is large enough to provide about 10 minutes of continuous usage. As the last thing that is worth mentioning is the automatic shut-off feature that prevents the steamer from overheating. Even if the manufacturers state that it can get about 10 minutes of continuous usage on a full tank, in reality, it gets about 7 minutes. That is not a lot. It might be enough to remove wrinkles from one item but anything more than that will mean several tank refills. The PurSteam fabric steamer is a great pick for the ones that are looking for something practical and inexpensive. It is the most popular model on our list and for a good reason. The steamer has a premium construction and an easy to fill system. 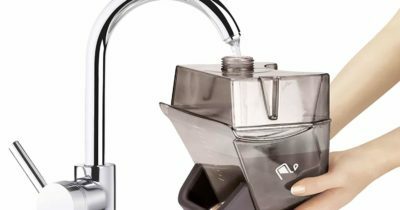 For the housing, the manufacturers used a BPA free plastic while the nozzle is made out of stainless steel. A full water tank will be enough for about 10 minutes while heating up takes about 90 seconds. The model tends to have a small problem in the sense that it will spit out water from time to time. It is not much but the biggest problem is that the water is a bit hot. If it is handled properly, the water will only be spilled onto the clothes. Safety features: A well-designed garment steamer needs to have an automatic shut-off function in case it exceeds certain temperatures. This ensures that the steamer will not overheat, it will not break down and it will not become dangerous to use. Tank capacity: Tank capacity will be important when it comes to for how long the steamer can be used before needing to be refilled. For portable steamers, 10 minutes of continuous use is considered decent. 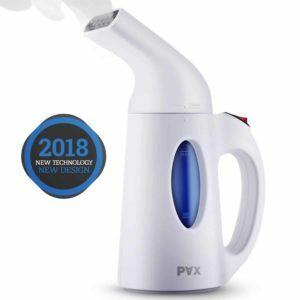 Portable or regular steamer? Portable steamers get just as hot as regular ones and offer very similar results. The main difference is that the regular one has a vertical pole and hanger for clothes while the compact and a significantly larger water tank.